He’s one of our own...Liam Cameron, he’s one of our own. Sheffield’s Commonwealth champion is getting quite a following amongst fellow Sheffield United fans. And as long as he can maintain his present nutritional protocols (avoiding the traditional Blades’ ‘greasy chip butty’) promotion is soon for the Bramall Lane regular. United’s first team Strength and Conditioning Coach told Cameron’s trainer Chris Smedley that the Manor Park fighter must be one of the broadest, tallest middleweights in the world. So if the strapping six footer can keep boiling down to 11 st 6lbs and continue delivering his powerful and precise boxing format, Cameron may well reach the level he craves, alongside Billy Joe Saunders. Friday’s iceSheffield defence against a limited, over-weight middleweight Nicky Jenman wasn’t perhaps a fight you could judge him by. But he still got him out of there within two rounds. Cameron, who had collected the belt once owned by Herol ‘Bomber’ Graham, last October in a Sheffield-derby win over Sam Sheedy, had some early success with upper cuts and hooks, while avoiding anything meaningful coming back. An accurately-delivered long-range right hand connected with the left side of the Brighton man’s face, and he went down heavily. Referee Terry O’Connor could conceivably have let battle continue, but Jenman, eyes glazed, seemed in no rush to do so and he waved the contest to a halt. Cameron later said he punched “like a mule” - and Jenman wouldn’t have argued with that either. The Sheffieler, who called out British champion Tommy Langford, says he will attend an IBF convention in Italy next month to test the waters for an eventual world title eliminator. Promoter Dennis Hobson thinks he is only a couple of fights away from that - and insists he Cameron take the Clinton Woods route to glory. 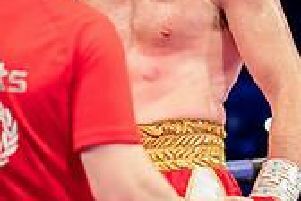 In the chief support, Sheffield’s Tommy Frank, 24, put on a boxing exhibition against the more aggressive come-forward Doncaster super fly Craig Derbyshire, 26, to strip him of his area title. Ten round points-victor Frank even found time to mimic the Saunders’ ‘where’s that punch gone’ gesture when Derbyshire missed, as he did frequently. Watch out for more on Frank this week. Sheffield light heavyweight Christian Kinsiona, Sheffield, enjoyed a four round TKO win over Manchester’s Curtis Gargano.